Yesterday my mother in law (aka MIL) and I tackled the laundry room floor. It went really smoothly (more so than I expected!) I keep waiting for something to go terrible wrong... but so far so good. 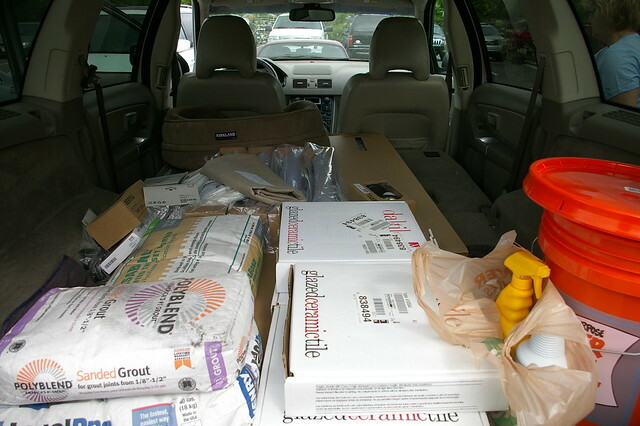 First we went to Home Depot to get all of our materials. I was so happy when the total came to around $250 for EVERYTHING. DIY is awesome! 1. 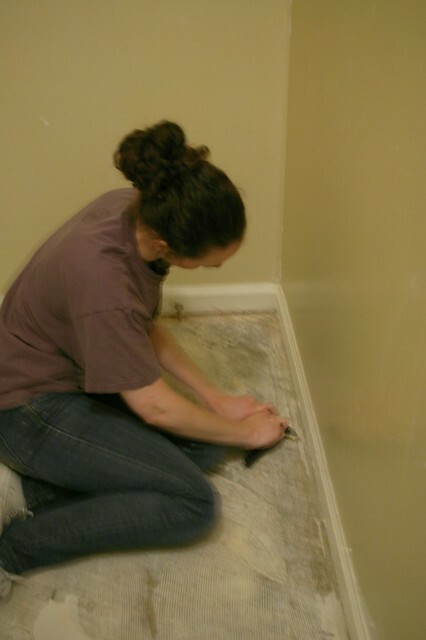 Remove quarter round moulding aka shoe moulding. We purchased a mini crowbar for this step. It was easy and we had it all removed in a matter of minutes! 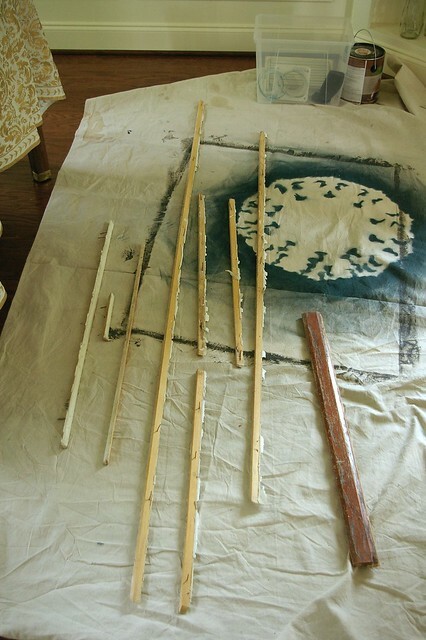 I think what we will do is bring each piece to Home Depot and have them cut new pieces to match the old pieces. 2. 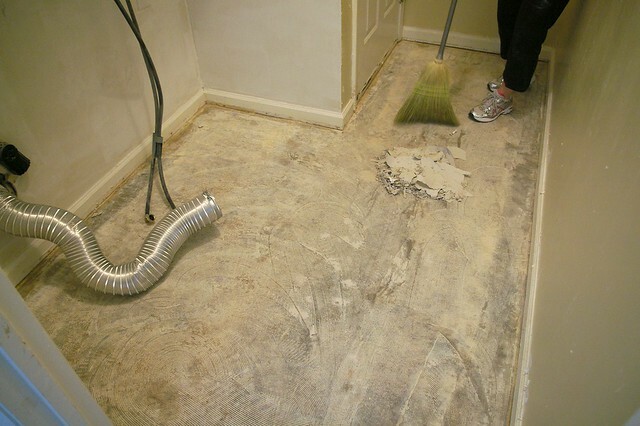 After shoe moulding is removed, pull up existing vinyl flooring. The vinyl came up EXTREMELY easy, thank god! 3. 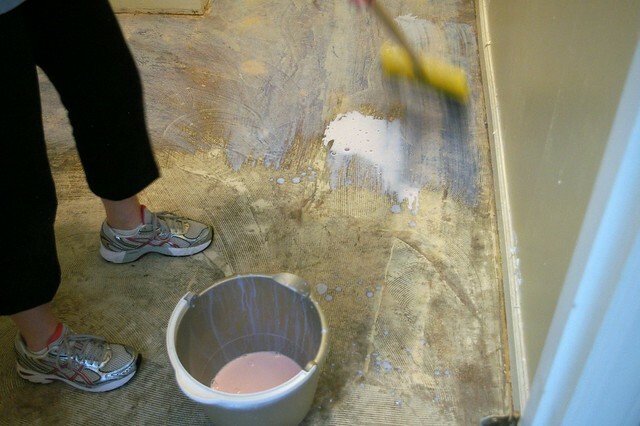 Remove any left over pieces of vinyl backing & clean the floor. 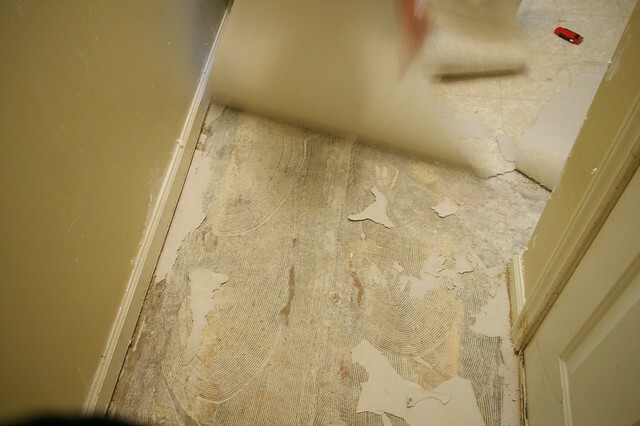 I had two wallpaper removal scrapers on hand.. MIL and I scraped the last of the flooring off that was stuck. We swept up all the remaining pieces. 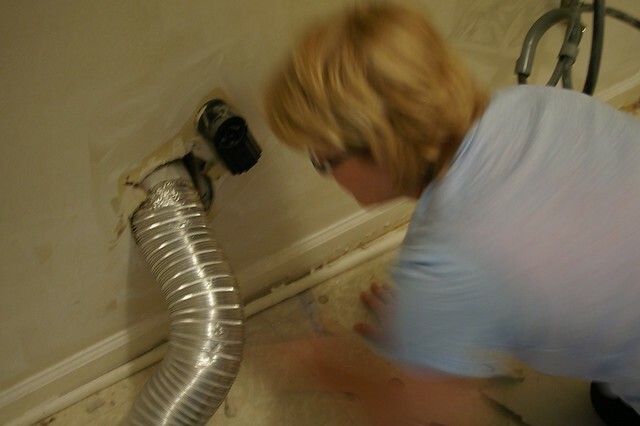 Then I ran a vacuum over the floor and suctioned the baseboards to make sure the entire floor was clean. 4. 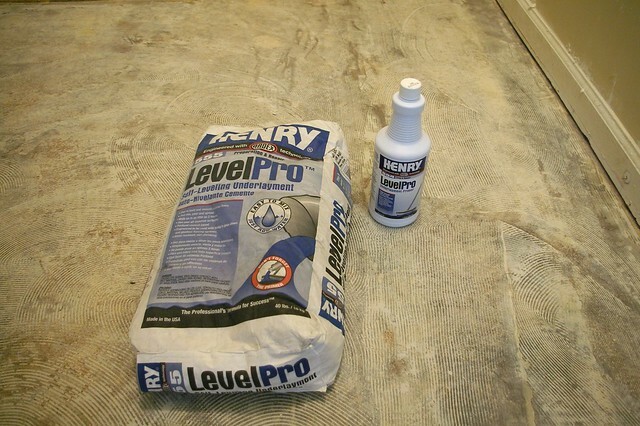 Spread on the floor leveler primer and let dry. 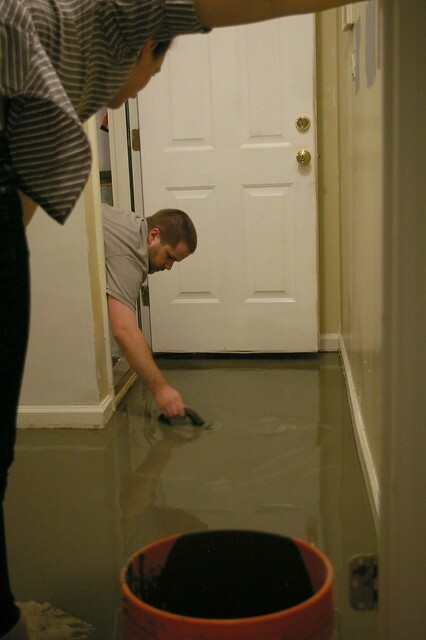 NOTE: Not all tile jobs require floor leveler. 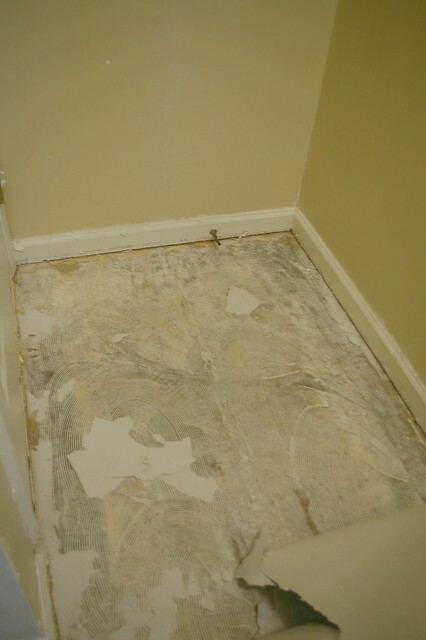 We decided to use it because there was existing glue on the floor and we weren't completely sure the floors were level anyway. 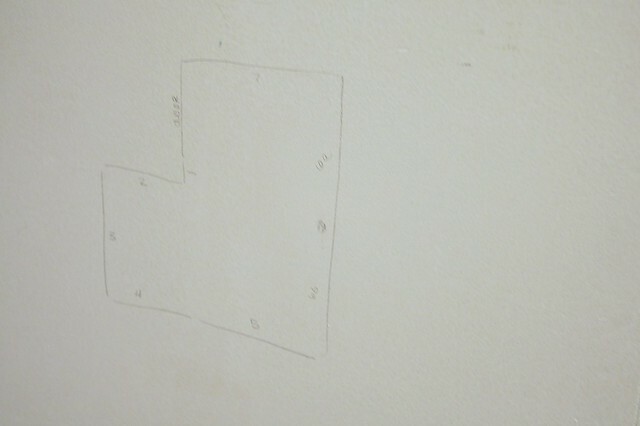 The folks at Home Depot recommended we use the leveler. The primer takes two coats with no less than three hours of dry time in between. We put the first coat on at noon. Then we took a shower and did a little shopping. Then we put the second coat on at 5 pm. 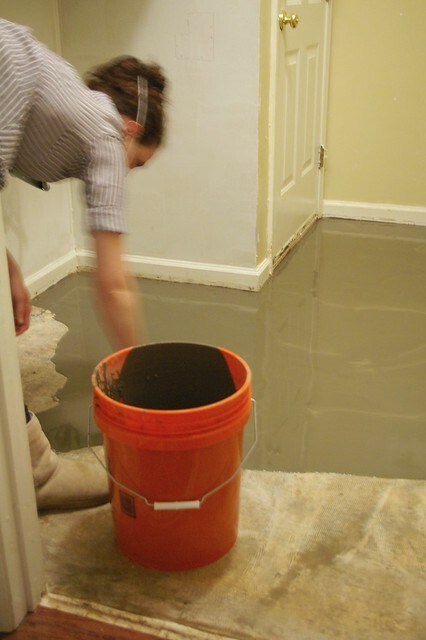 The floor was primed and ready for the self leveler mix at 8:30 pm. 5. 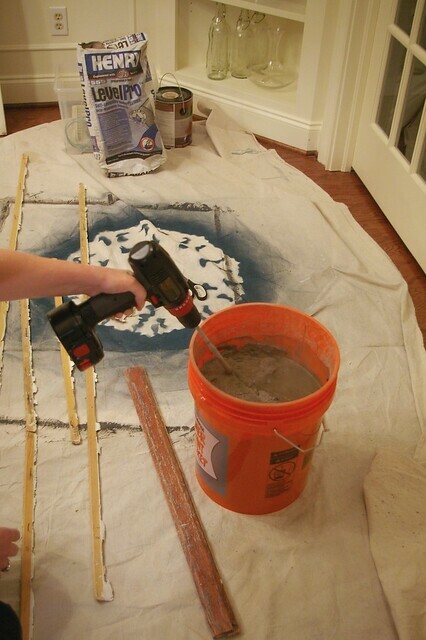 Mix and pour the self leveling concrete. I was most nervous about this step. I watched this and this video to learn more about the process. It really wasn't hard at all! The only hard part about this is the mix has to be poured within 10 minutes of mixing. This explains why I have the stupid mask still on in the following pictures (you should wear a mask when mixing concrete). It was a little stressful racing against the clock when pouring the mix, but we did it! We did this at 8:30 at night and let it dry overnight. Day 1 was a success! Now on to Day 2.... I'm a bit nervous! Kudos to you and the MIL!! What a project! I had to replace a doorknob myself the other day and I was nervous about about just doing that! But I figured it out- thanks to YouTube! Can't wait to see how it turns out! Go Bryn! Go Mom-in-law! You are inspiring me with your DIY. Hope all goes well today. 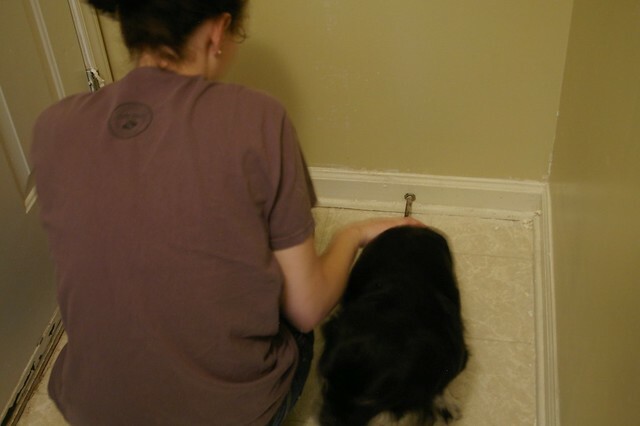 My Mom and I tiled her bathroom floor a few years ago. We get a lot of compliments, especially from the men in our lives who are impressed that we did it ourselves. I can't wait to get a home of my own some day so I can tile my own bathrooms! oooh I'm so excited for you! 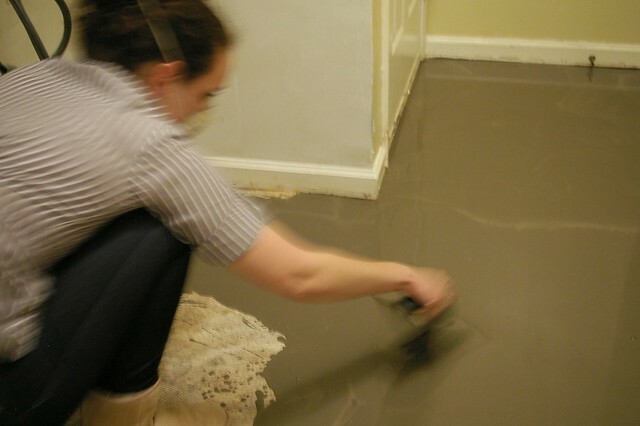 We've been thinking about re-tiling our bathroom floor sometime in the future! I've always wanted to lay down tile. My husband is a sub-contractor, so I don't think he'll let me use my elementary skills while he's around haha. You did a great job! This is so exciting! Thanks for the great play-by-play. Yay for DIY and saying good-bye to vinyl. Looks like a lot of work, but when you have help, it's so much easier to get done, no? 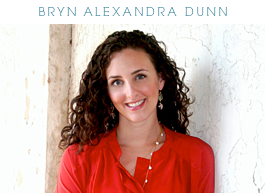 Bryn...I'm curious...how did you all get away with not using backerboard? 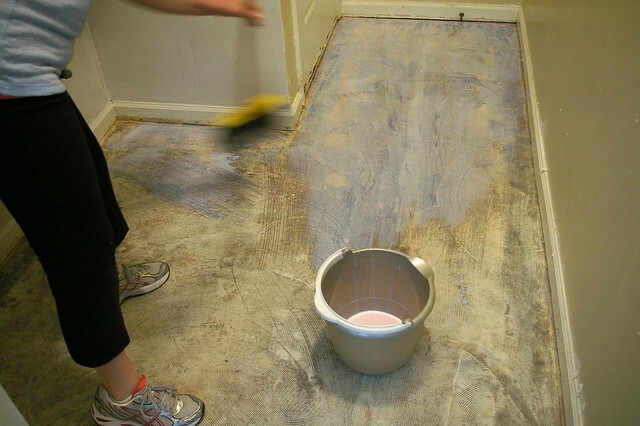 My husband and I had to pull up the linoleum AND the luan floor underlayment and THEN apply thinset and backboard. After that, more thinset and finally the tile! What's your secreat? Please do share!